Interesting mistakes on these bobbleheads! My family and I finally got our first bobblehead of the year and every time we get a bobblehead I always check them to see if there is any damage ones or something out of the ordinary. Like the upside down flag in the stadium replica you showed us last week. I think I ended up with one this time. For some reason my Maury Wills bobblehead had a hole in its right ear, that my wife was able to slip in an earring. I thought it was funny. But I bet there are other bobbleheads out there out of the ordinary or maybe I should say special nodders. Just thought I share this with you. Keep up the great work. Thanks. You're right, there are other bobbleheads out of the ordinary. Check this out. Hi Roberto, I went to the game and I got a bobblehead that I think is pretty interesting. 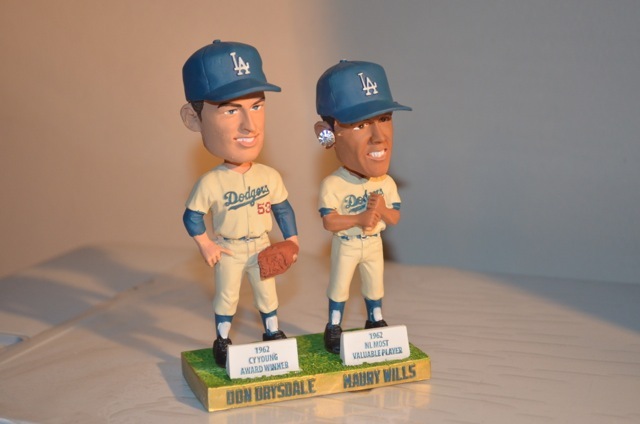 I think its interesting because it has Don Drysdale's head on Maury Wills' body. I included a picture to show you. Do you think it's worth more or less with the error? Thanks. My goodness, that's so strange. It might be worth more just because it's a rare item. You should save it for sure. Thanks Rahm and Michael for sharing your stories. And check back tomorrow to see a bobblehead that the Dodgers rejected! That's funny. Next their going to start giving out accessories for the bobbleheads, like for you kids dolls/action figures. Hair, shoes, dresses, weapons, tools etc. But for the bobblehead it will be uniforms, hats, helmets, glove, bat. When i opened the Box Wills head just fell off it wasnt properly glued you can see the glue dripping down the neck i had to re-glue it no biggy but the two drysdale heads are hilarious it would be cool that have that. My Drysdale bobblehead was missing his left arm! So I took pics and emailed it in...hopefully I'll get a new one. A friend of mine got his James Loney bobblehead replaced because it was broken.